Do you need to keep your dog safe at home in your yard? 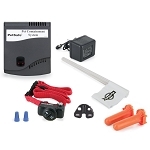 Would you like the convenience of a system with a rechargeable battery? 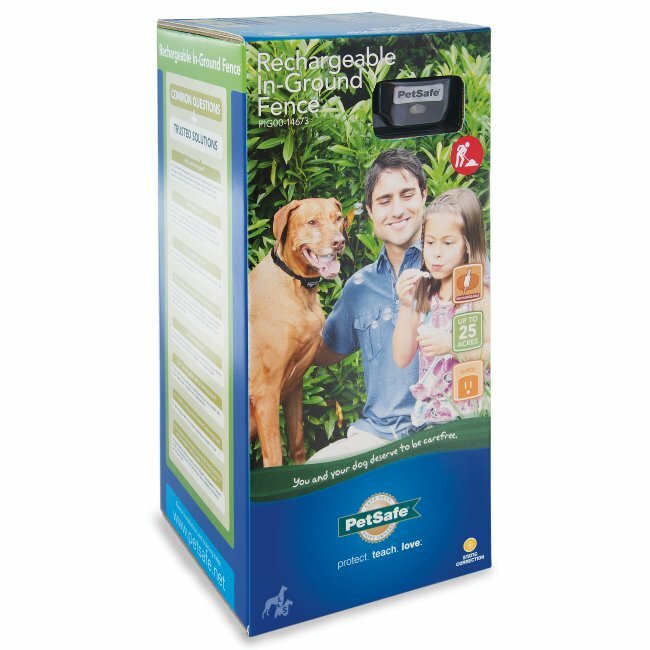 Then the Petsafe Rechargeable In-Ground Fence is the containment system that offers the convenience you are looking for. 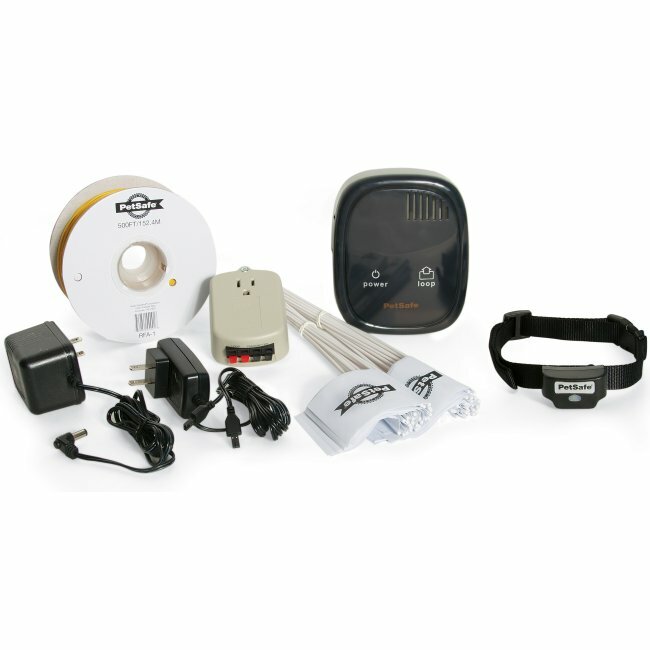 It features a rechargeable collar with the ability for you to create a tailored boundary to reliably contain your dog in any yard and can cover up to 25 acres with additional wire and flags. 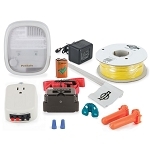 You can install this system in a few hours depending on the size of your yard. 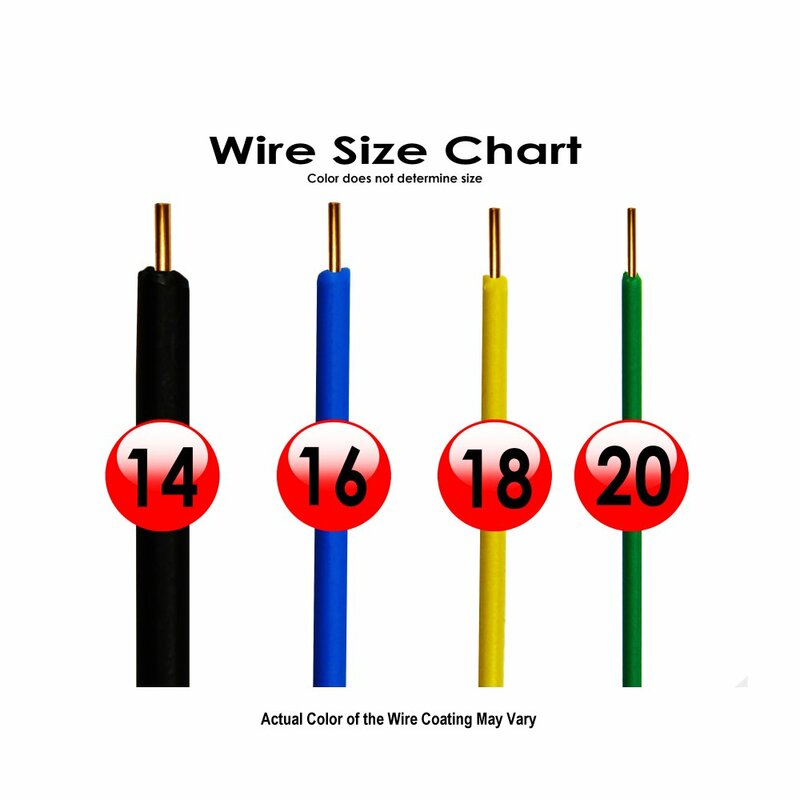 Cut Your Pet Fence Installation Time in HALF & Avoid The Task of Burying Wire. Use Our "Pet Fence Staples" to Install Your Underground Fence - Above Ground! Learn About Above Ground Pet Fence Installation. Do you have more than one pet? No problem. 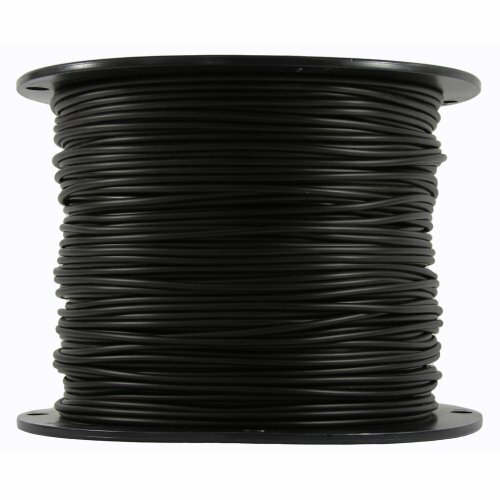 You can contain as many as you like as long as they are wearing a compatible Receiver Collar. Four adjustable levels of correction plus tone only mode for training lets you find just the right level for your pet. 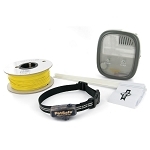 The Transmitter sends a radio signal through a boundary wire you bury around the perimeter of your yard to a Receiver Collar around his neck. When your pet approaches the Static Correction Zone, he hears a series of beeps from the Receiver Collar followed by a safe, Static Correction. The correction is designed to startle your pet and the sensation is similar to walking across carpeting, then touching a door knob. This method has been proven safe and effective and it will not harm your pet. Your pet quickly learns the areas he is free to enjoy. This Pet Fence Kit includes everything you need to contain one pet in a yard up to 1/3 acre. With additional wire and flags and dog fence collars, you can enclose up to 25 acres and contain an unlimited number of pets. First let me say that customer service was terrific at helping me troubleshoot the set up of our system. Our house sits on a huge open lot but we wanted our dog to be contained in a 1/2 acre section in where we could see him at all times while we're not outside with him. But breaking that area up with a real fence was not a practical option. We also wanted to be able to take him out with us on the rest of the property without having to worry about confusing him by walking through the containment area (accessed from a separate doorway). I was really concerned that without any visual barriers of where the containment area stopped/started this was going to be a problem. But at exactly one week he had it down. The first several days of training were a bit challenging. It was hard to know exactly when to correct the dog because I couldn't hear the collar beep without getting my head down close to his neck (which was distracting to the dog and made him think it was playtime). So I went around the boundary with the collar and carefully placed the flags right at the point where I heard the beep activate. Then I trusted the flags to know when to correct. Did not use the shock until day 7. Up to that point I wasn't sure he was understanding what we were doing. But that ONE shock made him jump back to me in a hurry. That's when I was glad for all work we did without the shock, because he suddenly knew exactly what the flags meant and hasn't been shocked since. It's been two weeks now and we have rabbits, squirrels, wandering dogs and even toys that accidentally pass the boundary and nothing will entice him to go through. Our dog is a Golden Retriever mix (maybe some Husky?). Without this system he'd be gone from the property within 5 minutes sniffing out a scent or just rambling off to explore. Knowing he is contained when we don't have time to play or be outside with him is a great relief! Watch lots of videos to be sure you understand the training process, commit to training everyday and be patient! I recommend no shock until your dog has had many sessions to learn that the flags are the signal to turn around. This was my first in-ground fence experience. I went with this DIY solution because the cost of a professionally installed system to contain 5 acres was prohibitive. I was able to rent a cable trencher for about $70/day and easily cut about 4,500 feet of trench in slightly damp soil in about 4 hours. The trencher also laid in the wire, so that was a non-issue. The only real challenge was twisting the wires to cancel the signal where it crossed the yard. I had to create a about a 60-foot twisted wire. This is relatively easy to do using a power drill except that the wire is constantly trying to untwist itself. The longer the run, the worse it gets. It Took two of us to wrangle the wire and this was by far the most difficult step to manage. I mounted the power unit on a wall in the garage, ran the wire through the wall and into a small section of conduit down to the trench. After some confusion about power settings and how to make them (I'm embarrassed to admit that I overlooked the fact the front of the power unit opens to reveal the dials) and thank to some help from a great customer service guy, the unit was functioning. Training was a little dicey and my dogs got shocked more than I thought they would. But it's been about a month since installation and they're doing fantastic. I haven't had the confidence to remove the flags yet. I'll begin removing them gradually this week. All in all, I am thrilled with the cost and quality of this product. It has given my dogs new freedom and my family peace of mind. Even though I purchased this product I was a little skeptical because one of my dogs, a Rat Terrier mix, is so hardheaded and would constantly run after cars and neighbors and bark at them whenever they came out of their house. She would lead my other dog into the road and I was afraid they would both be hit by the cars. I set up the system covering about 5 acres using a home made trencher - attaching a long bolt on the back of my tractor that cut the earth to the depth I needed. After that I laid the wire and covered it over. I began the training and followed the process as it was explained in the booklet that came with the product, and my two dogs are now contained and safe. I did not want to be one of those people whose dogs bothered the neighbors and now I am not one. I have not yet taken down the flags but will begin to do so this coming weekend as directed. Thanks to you,RadioFence, I now have dogs that can be free to go outside during the day and be safe without bothering the neighbors. What a relief to have found this system and put it into effect so that I could keep my escapist rescue dog. Thank you. It has been working just great for over a year now. Arrived within a few days of purchase. 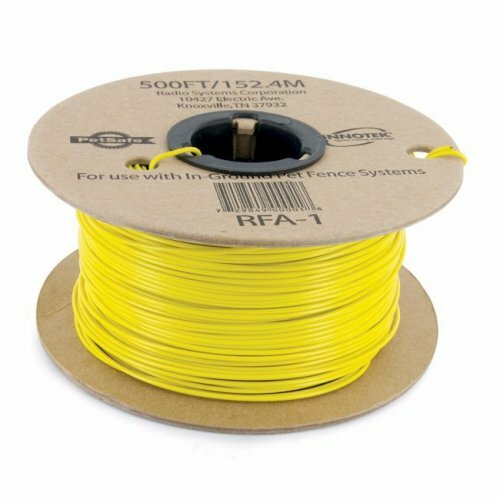 I was able to disconnect my old system and connect this to my current in ground fence with no trouble. I wish it had a battery backup for power outages like my old system. My Pointer is a master escape artist from my fenced in back yard. The Radio fence was easy to set up and run the wire around the perimeter of the fence. I had to play around with boundary width and correction intensity to get it just right but now it works like a charm. My dog still digs like crazy but she is no longer escaping from the fenced in area. Can only say Customer service is good. First day I put it up transmitter didn't work. Called customer service and they are sending new transmitter right away no problem. Great service hope new one works better. I would recommend having the transmitter in a warmer area than the carport. The log walls shouldn't interfere with the functions at all and the foot of snow shouldn't interfere either. Q: what is the model number for this item? 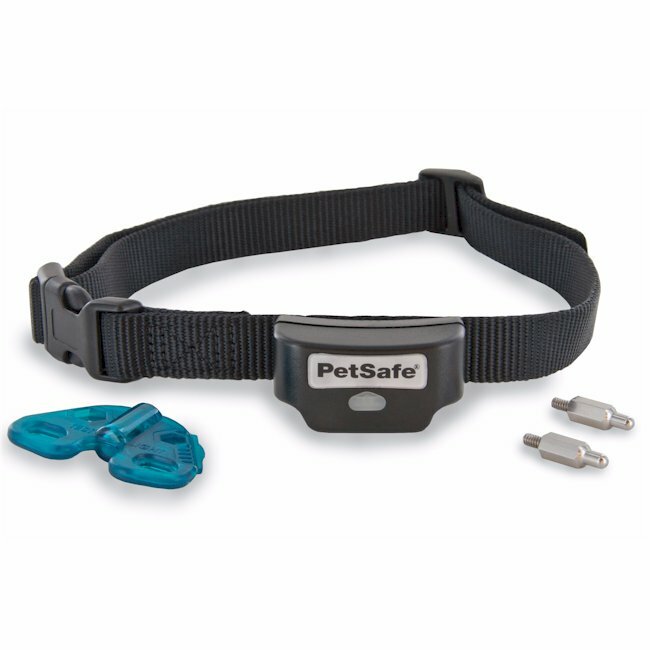 Can you use a cat collar as well as dog collar? A: The model number for this item is PIG00-14673. 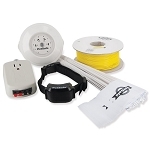 And yes, you can use any of PetSafe's In ground system collars. Q: I may need to add two more dogs to my containment system, and I’m not sure how to order the extra collars and make sure they will work. Can you please tell me? Thank you!